Here is a quick overview of Image Relay's user interface. 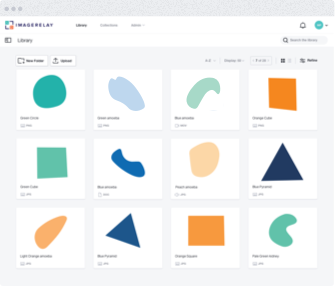 Image Relay has always been committed to making a simple, intuitive, and flexible digital asset management solution, and making that happen with your help. We’re thrilled to announce some improvements that will take those goals to the next level. We also made Image Relay a lot more beautiful. Here’s how the new Image Relay will help your team. The responsive UI makes your assets pop and makes it easier to find and organize your assets. The design is clean and we remove clutter and dead space. There’s nothing to keep you from working with your assets. To help reduce that clutter and provide more screen space for working with your files, there is a collapsible folder tree on the left. Use the folder structure when you need it and get it out of the way when you don’t. Use the folder tree to browse your nested folders and get to where your files are fast. Even if you close the folder tree, you won’t lose your place because easy-to-follow breadcrumbs remain up top. Everything is cleaner and faster so you can spend more time working with your assets. Important creative work doesn’t happen only at your desk. You need to work on your couch, in a cab, running across town, or thirty-five thousand feet in the air. 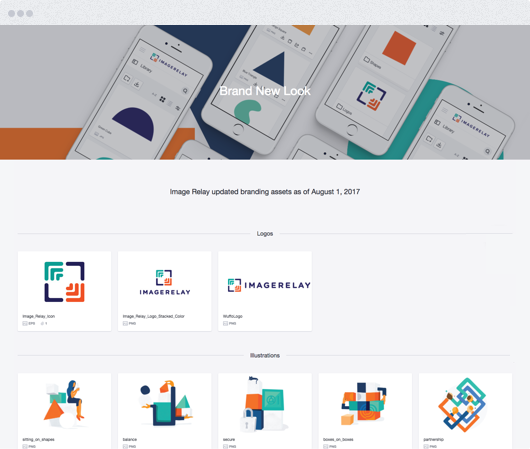 Image Relay’s new responsive design makes that easy. There are no apps to download, just use Image Relay on any device you choose and the experience will be optimized. Combined with our new layout, you have to see what this looks like on a large monitor. With maximum workspace, you can see so much more and play around like you’re a kid in a giant sandbox. And if you’re on the move, uploading, downloading, sharing, and collaborating using Image Relay has never been easier. Your assets come alive on your websites, in videos, in your ads, and loads of other places. Collections allow you to curate, collaborate, and communicate directly from the Image Relay platform. Whether you are combining assets to tell compelling stories for a campaign launch, sales presentations, a product launch, sharing your brand guide, or building a media site, Collections make it easy and beautiful. Here’s one example of a Collection. You can add a header image, add titles and descriptions, and create sections to keep things organized or tell a story. Our new Collections also make it easier to collaborate inside or outside your company. People can contribute to collections or simply follow to keep up-to-date with any new changes. We’re really excited about these new Collections features and there’s so much to share that they deserve their own post, so check out this deeper dive to learn more. Updated Search and Refine Tools. The estimates vary but industry studies show that 10-30% of a worker’s time is spent searching for files. That’s a huge problem and something Image Relay has been tackling since day one. With our new search and refine tools, the time spent searching for the right file will be even shorter. File format - Do you need to find web-ready photos for a new website launch? Image Relay works with any file format and you can quickly filter by file type - images, documents, videos - it doesn’t matter, you’ll get the ones you need fast. Tags - How do you find photos of your new product? Of course you can keep all of those in a dedicated folder but you can also add tags to each photo. Tag them how you life and bring them all together by filtering by tag, no matter where the files live in your folders. Dates - Want to see the newest files, or maybe you want to see files from last year’s holiday campaign? Quickly filter to find files uploaded in the last 24 hours, the last 7 days, the last month, or in any custom date range you choose. Orientation - Does your company have a bunch of logo types? Whether they’re horizontal, vertical, or stacked, you can quickly narrow your files down to find the right one. Color - You’re running a new campaign and need images that will match well with a green border, how do you find images with the right color balance? Image Relay automatically identifies the predominant color of each file, making it easy for your team to filter and find the right file. Quick Action and File Selection. Flexibility is key to our clients and we heard from them about wanting more flexibility working with larger groups of assets or assets spread across various folders. Now you can use Image Relay to select a file, a folder, or any combination and complete bulk actions quickly. Suppose your team is launching a new campaign and you want to gather a number of assets to get a campaign folder started. You may need some logos, some photos, a video or two, and some other images. These assets live across a number of different folders, but with our new selection tool you can select whatever files or folders you want and then move them all to a new folder with a click of a button. If you select files in one folder and then move to another, Image Relay keeps those files selected, so you can bounce around without missing a beat. These are the big changes we know will help your team work better and faster. Over the last fifteen years, our commitment to working with and providing solutions for our clients has never wavered, and it never will. We hope these changes make your job easier and we’d love to hear from you about what you’d like to see in the future.